The guys from The Press Room Group have never been afraid to venture into untapped territories. When they opened their first restaurant in 2006, they opted for a relatively quiet stretch on Hollywood instead of a more obvious location in Soho or LKF; when they invaded Wan Chai with a Classified cheese room, they went with the then-still-underrated Star Street rather than something around Lockhart. Their gambles usually pay off and with The News Room, they’ve placed their bets on Quarry Bay. The space bears resemblance to the original Press Room restaurant with a sleek bistro design that’d fit right in on London’s Dover Street. A bonus here is the wide frontage which connects the bar area to tables scattered around the spacious sidewalk just outside Taikoo Place. Going alfresco is a good idea especially since some of the indoor tables enjoy a less than thrilling view of the neighbouring McDonald’s. Like its sister venue, simplicity is the driving force for most of the dishes at The News Room. The Louisiana chilli crab cakes ($98) are worth ordering for starters. Blanketed under tufts of arugula, these loosely packed patties don’t look particularly promising at first. But a bite is rewarded with shreds of succulent, creamy crabmeat, delicately spiced up with a mix of salt, pepper and lemon juice. The tiger prawn cocktail ($116) on the other hand fails to inspire. It’s visually appealing with three plump prawns balancing off the edge of a Martini glass but the shellfish are a touch overcooked and robbed of flavour. It’s safe to say that the restaurant’s real strength lies in its larger plates. The grilled steaks, in particular, are spot on. Ordered at medium rare, the 10oz USDA Nebraska prime ribeye ($335) arrives with a slight char on the surface that gives way to a red centre amped up with meat juices. It’s a cut that doesn’t need any additional sauces to draw out the flavours. Leave your condiments for the fries, which are diligently seasoned with salt and plated piping hot on the side, ready to be dunked in ketchup or mayo. 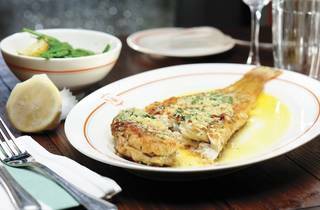 But good as the steak is, the better main here is the fish – more specifically, the perfectly grilled Dover sole served with creamy new potatoes and French beans ($245). 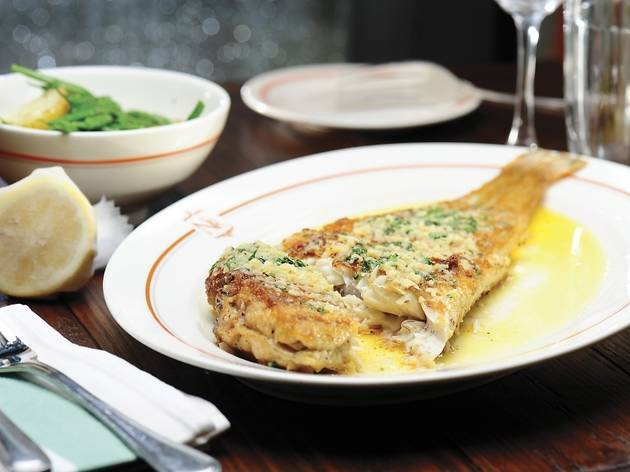 The flat fish is cooked on the bone for maximum flavour and the skin is slathered with a brilliant garlic and parsley butter sauce. It’s on the oily side, but all for good measure. A squeeze of lemon juice wakes up all the flavours... we only wish we had some bread on the side to sop up all that garlicky, salty goodness. 33 Tong Chong St, Quarry Bay, 2562 3444; www.thenewsroom.hk. Mon-Fri 7.30am-midnight & Sat-Sun 10am-midnight.